Without bacteria we would die. Yet we wage war against them as if bacteria were a mortal enemy. And we try to kill everything as a solution to any problem. Years ago, Heartland Healing wrote about biophobia, a portmanteau we coined describing humans’ irrational fear of life and living things. We kill animals, insects, weeds, plants, bacteria, viruses without considering the consequences. Our earlier column on biophobia is pretty good so if you missed it, we reprise it here. Humankind typically tries to solve a problem by destroying or killing. Nothing could be more misguided than our intense crusade to kill bacteria that exist all around us and within our bodies. It turns out that even scientists, who typically lag behind what the general populace already knows, are now catching on. Overkilling bacteria is a bad idea. Hug your bugs. Bacteria live within us by the trillions and we’re treating them all wrong, as if they don’t belong. The bacteria that live in a body far outnumber the human cells. Over 90 percent of the human body is non-human, mostly bacteria and fungi. And that animal zoo living within us is crucial to our wellbeing. The intestinal biota and dermal biota are essential to staying healthy. Mess with them at your own risk. Here are just a few of the important things your inner bugs do. Immune system support Intestinal flora support and train the immune system. Babies are born with no bacteria in the intestine and one of the first important things to happen is that bacteria are introduced into their system during breastfeeding. The mother’s colostrum virtually inoculates the baby’s immune system while bacteria introduced by close contact with the mother’s skin provides a kick-start for the infantile immune system. The bacteria help program the infant’s immune system to attack bad bugs but to leave good ones alone. The positive influence on the immune system continues throughout a healthy life. A healthy immune system requires a healthy bacterial population in the body. Nutrition from bugs The bacterial population of the intestines produces nutrients such as biotin, folate and vitamin K. Intestinal microbes facilitate digestion and break down foods that the human intestine ordinarily could not handle. Many intestinal bacteria provide enzymes to metabolize foods and help us absorb dietary minerals. Healthy bugs mean a healthy gut. Intestinal flora protects the lining of the intestines, both large and small. By displacing populations of more toxic yeast or bacteria, the helpful ones keep pathogens from gaining a toehold in the intestinal mucosa. A healthy population of good guys helps keep the bad guys at bay. There is some indication that healthy beneficial microbes help the cell wall of the intestine from developing cancers by affecting localized immune system response and controlling the differentiation of the mucosal cells. There is also evidence that having a healthy population of intestinal microbes can help prevent problems like Crohn’s Disease, diverticulitis, ulcerative colitis and irritable bowel syndrome. Other researchers have found that native gut flora is important in preventing the development of allergies, symptoms that are increasing rapidly in the American population. Antibiotics are antihuman. If our bodies are 90 percent bacteria and microbes, our efforts to kill them off is suicide. Humans obviously fail to understand this, considering the massive attack we make on deleting each and every living thing around us. We are obsessed with maintaining a sterile environment, based on our continuous use of antibacterial soap, sprays, wipes and drugs. We even buy trousers and toys that are made with chemically prepared antimicrobial fabric. Furniture and phones tout “antibacterial” surfaces. While the judicious use of powerful antibiotics in extreme cases can be assumed to save lives, overuse of antibiotics is costing us in disease and death while altering the evolution of pathogenic bacterial species. We’ve dimwittedly managed to produce chemicals and antibiotics that have evolutionarily selected for survivability and created strains of supermicrobes that threaten to be the deadliest in existence. A recent news report noted that just one dose of antibiotic can alter our intestinal bacteria and open the door for deadly strains such as Clostridium difficile. Think long and hard before you take an antibiotic. Humans as the perfect Petri dish. Just as in a lab experiment, microbes rely on their nutrient substrate. In the case of the human body, our food choices provide the food our flora depends on. And as with a Petri dish, whatever we make available will tend to favor the bugs and bacteria that like that particular food. So, who likes sugar? We certainly eat enough of it. Who prefers alcohol? We can survey the hundred trillion microbes in our body to find out what each species likes or just see who prospers and proliferates under certain dietary choices. In this way we bear influence on the population within. When our nutrition gets out of balance, our internal population gets out of balance. Bacteria that thrive in an acidic environment can be affected by food that we eat that balances the pH of the body toward acidic. 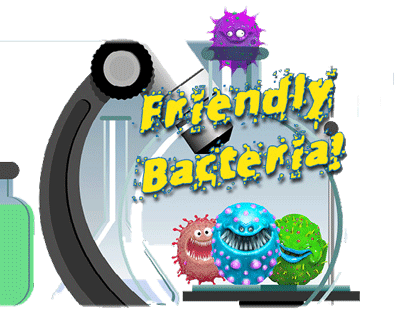 The bacteria in our body can change from friend to foe based on what we feed them. Fear not. There is a better way than killing and attacking, taking the negative approach. A healthy lifestyle, good nutrition and traditional therapies will build up the immune system and give support to the body’s own healing energy. That’s a tack if taken that can serve society well in any area.